Many webmasters have plenty of free files for their visitors to download. In certain cases, you want want to keep your files or links available for a limited time. 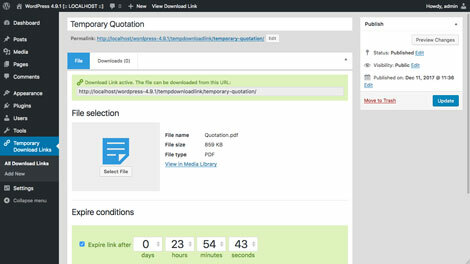 Temporary Download Links for WordPress can help. 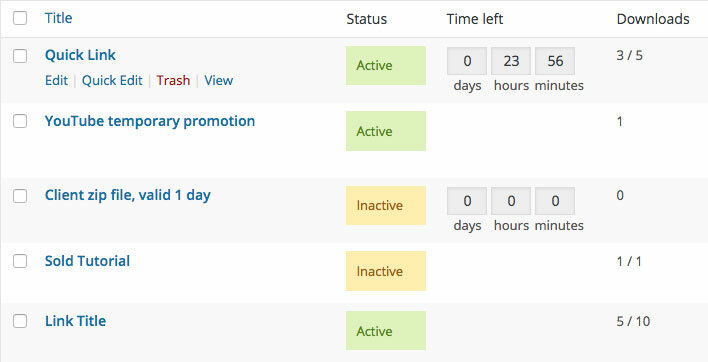 It lets you expire links after a certain period of time or a certain # of downloads. This plugin allows you to make your download links to Media Library files non-direct. Not only your links expire after a certain period of time or # of downloads, you will also be able to see how many times your files have been downloaded. The plugin also shows referrer and IP address associated with the downloads. Temporary Download Links is a paid plugin by DeEindbaas. You can download it here.